The Verona Touch Lamp. Supplied with 2 x G9 bulbs. Depth: 10.5cm. Width: 25cm. Northern Ireland, Isle of Man, Isles of Scilly, BT, IM, TR21-25, Isle of Wight PO30-41 Channel Islands JE GY. Pleated drum shade, white lining. Complete with pale cream (almost white). Clear acrylic finial feature at top of shade. 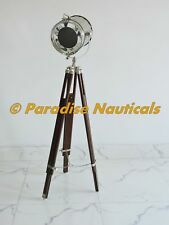 Art Deco Style Standard / Floor Lamp. Frosted glass tubular shades. Khufu 12" Square Tiffany Glass Art Deco Style Table Lamp. Light up your world with an enchanting rainbow of colour and light when you add this gorgeous Art Deco style Tiffany-style table lamp to your room. Tiffany Styled Stained Glass Cream Jewelled Table Lamp 18"
WE SPECIALISE IN QUALITY UNUSUAL LIGHTING/GIFTS NOT WIDELY AVAILABLE. Hand made Tiffany style lamp. Cream glass with clear jewels. Leaded glass and sculpted resin base. Requires 40 watt bc golf ball bulbs or LEDs (not included). ANTIQUE BRASS BASE WITH 4 FACETED CRYSTAL PIECES. BRASS LAMP HOLDER & GOLD CABLE. SUITABLE FOR USE WITH YOUR OWN SHADE. VERY ATTRACTIVE LAMP BASE. IDEAL FOR BEDSIDE OR LIVING ROOM HALL ETC. WILL TAKE 60 WATT BC BULB OR LED. Pleated drum shade, white lining. Complete with pale cream (almost white). Clear acrylic finial feature at top of shade. Stunning black & brushed bronze floor standard lamp. Black cable with in-line foot switch. A handmade mood lamp made from a single drum on a tripod stand. Idea for a retro look. 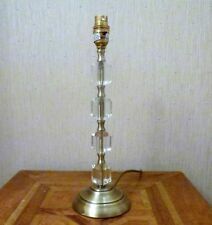 Style / Model : Laura Ashley brass table lamp. 3 Pin UK plug with 160cm cord and inline on off switch. Small Edison screw fitting. Italian made. Painted brass. Ivory colour. Light bulb is not included in the sale. By Onex salt lamp Beautiful 100% Natural Himalayan Rock Salt Lamp. Himalayan Salt Lamp with therapeutic benefits for your health and wellbeing. MADE FROM PIECES OF IVORY STAINED GLASS IN THE TIFFANY ART DECO STYLE. 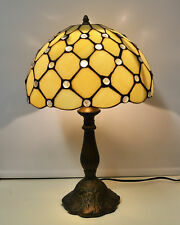 GORGEOUS STAINED GLASS TABLE LAMP. THIS LAMP IS FITTED WITH 3 PIN BRITISH STANDARD PLUG . as our experience is that delayed orders can frequently be found there. Product Type: Table Lamp Set Bulb Type: G4 Number of Bulbs: 3 (Included) Max Bulb Wattage: 10 Watt Light Source: Halogen Colours: Brown, Clear Height: 16 cm approx Width: 12 cm approx Length: 35 cm approx Material: Wood, Glass Voltage: 220 - 240 Volts Product Weight: 1.92 kg Technical Information Energy Efficient With Appropriate Bulb In-Line Dimmer Switch Please note: Images are for illustration purposes only. Your order will be delivered by Royal Mail, unless the item(s) exceeds the size and weight restrictions. Larger, heavier items will be delivered by DPD courier. Glass Table Lamp Shade. Condition is Used. Collection in person only. It features a tinted glass shade, closed in a shiny copper cage. It gives your living room, dining room or kitchen a touch of old-style industrial design and is perfect to pair with different types of designer light bulbs. Coulour Temp = 5650k. 65W (325w equivalent) Continuous CFL Bulb. This is the UK's most affordable energy efficient alternative to the halogen uplighter floor lamp. The bulb in Green Lamp has been specifically chosen to provide a warm light, just like a halogen. Tripod Material: Steel & Aluminum. Tripod Finish: Brown Finish. BULB WILL NOT SEND WITH ANY LAMP FOR SAFETY REASONS. Type : Floor Lamp/Corner Light. This table lamp is perfect for placing all over the house and will help add a bit of sparkle to your interiors. The Paavo touch lamp also has 3 different brightness settings so you can adjust to your needs.